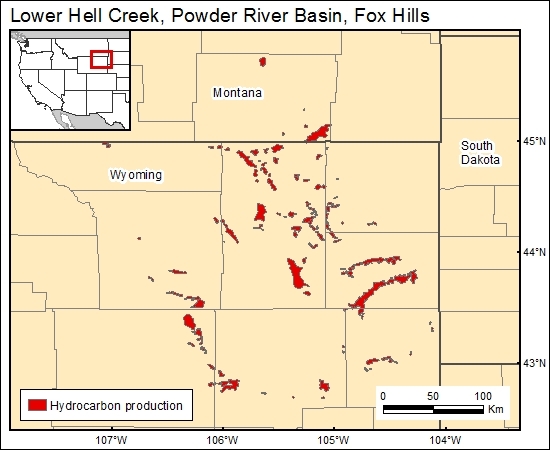 The Fox Hills has negligible volumes of hydrocarbon production in the Powder River Basin (Gluskoter and others, 1991), although distal equivalent sandstone facies encased in the Lewis Shale are productive in the southeast part of the basin (Mullen and Barlow and Haun, Inc., 1993). Gluskoter, H. J., Rice, D. D., and Taylor, R. B., 1991, eds., The Bureau of Economic Geology, The Geology of North America: The Geological Society of America, v 2. Mullen, D. M., and Barlow and Haun, Inc., 1993, Powder River Basin (Section FS-1), in Hjellming, C. A., ed., Atlas of major Rocky Mountain gas reservoirs: New Mexico Bureau of Mines and Mineral Resources, Geological Survey of Wyoming, Colorado Geological Survey, Utah Geological Survey, Barlow and Haun, Intera, and Methane Resources Group, Ltd., p. 70.